John Henry Spree (1869-1932) was a prolific publisher of post-cards with over 1,000 to his credit. He operated first in East Sussex and later in the East Midlands. This fascinating book contains 220 images taken in Nottinghamshire during the period 1915 - when he moved from Hastings to Nottingham - until his death in 1932. Each image has a brief, but informative, caption. John Henry Spree was born in Canterbury in 1869. He married Esther Jane Glazier in 1891, at Westfield in Sussex. He and his family moved to St Leonard’s on Sea, where after working on the railways he took a job as a photographer in Hastings. In 1915 he and his family moved to Nottingham, where he started his own business as a photographer in Lenton. The business was unsuccessful, so he obtained a job with another photographer, and began to produce and market postcards which sold well. He had his own car, a Bull-nose Morris, and toured the East Midlands looking for scenes to photograph. The postcards were sold through various retailers, including WH Smith. The postcards themselves are sought after by collectors. The book includes an article about John Henry Spree’s life, and details of his photographic techniques. 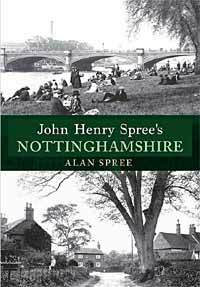 The compiler of this book, which your reviewer highly recommends, is Alan Spree, John Henry’s great-grandson.